This homegrown Erin Brockovich story follows former Whakatane sawmill worker Joe Harawira and his long battle to reveal the impact that workplace toxins have had on his community. 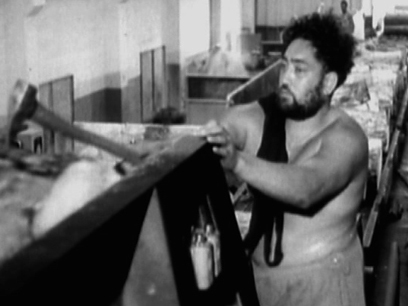 In the 80s after being afflicted by health issues, Harawira noticed co-workers getting sick. In 1988 he helped found SWAP (Sawmill Workers Against Poisons) and began investigating the effects of exposure to dioxins, a by-product of timber treatment. 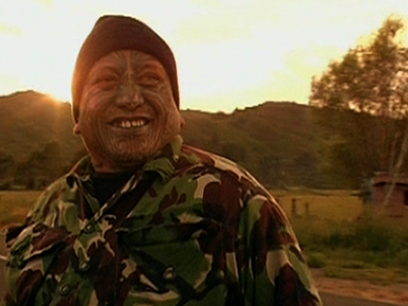 The Joe versus the mills crusade screened on Māori Television, and won Best Popular Documentary at the 2012 NZ Television Awards. On October 15 2007, citing evidence of guerilla camps involving firearms training, police raided 60 houses across NZ, many of them in Ruatoki, near Whakatane. In production for almost as many years as the ensuing legal proceedings, this provocative documentary proposes that the so-called “anti-terrorism” raids were bungled, racist and needlessly terrifying to children. The film’s subtitle ‘Deep in the Forest’ is inspired by ex Red Squad second-in-command Ross Meurant, who argues that as police move into specialist units they grow increasingly paranoid. Just after midnight on November 18, 1982, Neil Roberts, a 22-year old anarchist, exploded a bag of gelignite outside the Whanganui police computer centre, killing himself instantly. 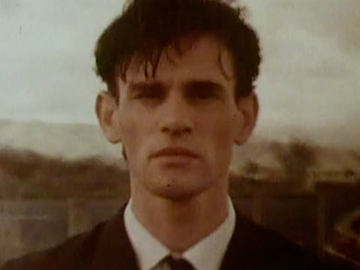 In this short film, director William Keddell uses a fictional character — Eric, a young man awoken in bed at the exact moment of detonation — to take a psychological road-trip exploring the events leading up to what is arguably NZ’s most famous case of homegrown political terrorism. Real-life friends and associates of Roberts make cameo appearances in supporting roles. 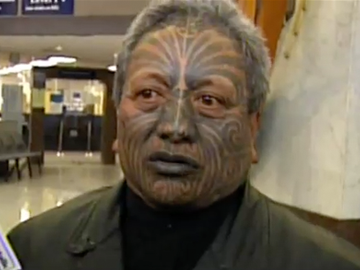 This documentary presents insight into the man most New Zealanders know as the Māori radical with a moko. Delving beyond the sensational headlines, it presents Tame Iti in the context of his whānau and beliefs. Iti tells his own story: from growing up in his beloved Urewera, and his role in organisation Ngā Tamatoa, to heroes (Rua Kenana, Che Guevara), moko, match-making and a late-starting art career. Iti’s children reflect on an activist father who “is a kid at heart”. Chelsea Winstanley's documentary screened on TV2, before Iti’s arrest during the infamous 2007 ‘Urewera raids’. 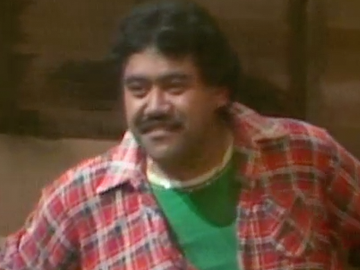 The powerhouse, largely Māori cast of this teleplay includes Jim Moriarty, Merata Mita, Billy T James (as a Marxist) and, in his acting debut, Zac Wallace (star of Utu). The Protesters explores issues involving race and land ownership in the aftermath of the Springbok Tour and Bastion Point. A group of Māori and Pākehā protestors occupy ancestral land that the government wants to sell. While waiting for the police to arrive, they debate whether to go quietly or respond with violence. Though some wounds are healed, The Protesters ends on a note of division, reflecting the era it was made in. 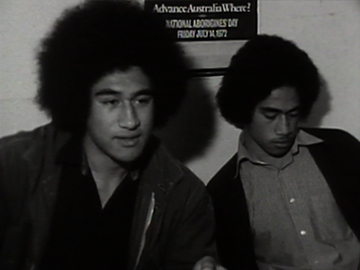 This 1977 film looks at the meeting of the 'two rivers' (Māori and Pākehā, oral and written) of the Aotearoa literary tradition. Rowley Habib is a guide as hui take place and readings of contemporary Māori poetry are set to images of Māori life, from Parihaka and land march photos to Bastion Point, urban scenes and a Black Power hangi. Poets include Mana Cracknell, Peter Croucher, Robin Kora, (a young) Keri Hulme, Brian King, Apirana Taylor, Katarina Mataira, Don Selwyn, Henare Dewes, Rangi Faith, Dinah Rawiri, Haare Williams, Hone Tuwhare, and Arapera Blank. 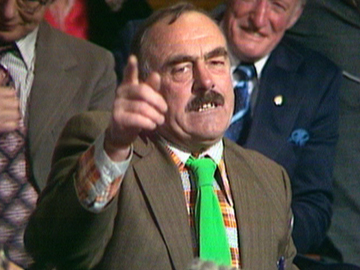 On June 4 1976, Gordon Dryden hosted Abraham Ordia — president of the African Supreme Council of Sport — for a public forum on New Zealand’s sporting ties with apartheid South Africa, which would result in an Olympic boycott by African countries the following month. The debate erupted into what the Auckland Star called “a diabolic confrontation between Māori and Pākeha”, with Dryden frequently pleading for civility. Weightlifter Precious McKenzie, MP Richard Prebble, activist Syd Jackson and Donna Awatere-Huata are among those in the audience, making their feelings known.